Microsoft has put together a concept video showing off an immersive gaming setup where gameplay extends beyond the piddling confines of your TV. 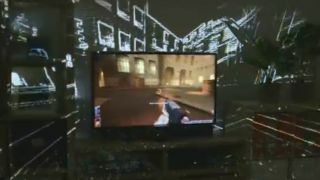 The IllumiRoom idea, which Microsoft patented late last year, basically turns your whole room into the gaming canvas using a Kinect for Windows camera coupled with a projector connected to the console as well as the TV. The video shows bits and pieces of game debris shooting out of the screen and around the room, the idea being to put your peripheral vision to good use and generally give you a 'being there' vibe as you play. Or, as Microsoft puts it, "blending our virtual and physical worlds with projected visualisations". The company also insists that the effects shown "are rendered in real time and are captured live - not special effects added in post processing", which gives us the impression that it's seriously serious about this one. The developers behind the project added, "Our system can change the appearance of the room, induce apparent motion, extend the field of view, and enable entirely new game experiences. "Our system uses the appearance and the geometry of the room (captured by Kinect) to adapt the projected visuals in real-time without any need to custom pre-process the graphics." Will we see this full-room gaming hit the market alongside the next generation Xbox 720? It's part of Microsoft's Research division at the moment so the jury's out - but imagine how good it would be coupled with Kinect's motion sensing prowess.